LCD flat panel installation growth has been one of the most dramatic in the past few years due to the resurgence of video walls. Take a closer look at the technology behind new-generation video walls in this select group of articles, videos, and product releases on the developments in these booming areas. Video walls have been a part of the AV landscape for decades. But for most of that history, video walls were bulky, cumbersome, hard-to install, and generally very compromised in terms of visual quality, resolution, and flexibility. Those older generation Video Walls were made up of stacked video monitors—really just stacked TVs or monitors that presented the familiar “grid” of images. In that older technology, the grid was always visible and distracting. And even with the advent of LCD/LED flat panels in recent years, most Video Walls are not using the latest, most advanced, thin or super-thin bezel designs. But in recent years technology improvements and engineering breakthroughs have allowed thinner mullions, or “bezels” in Video Walls. (The term bezel refers of course to the black line, or thin border between each screen that makes up a Video Wall.) The best video wall/flat panel display manufacturers are offering bezel sizes in the “Narrow” range: about 3.5mm bezel width. But only the A-tier display and Video Wall manufacturers are making “super narrow bezel” products available with a bezel size of as little as 1.8mm. 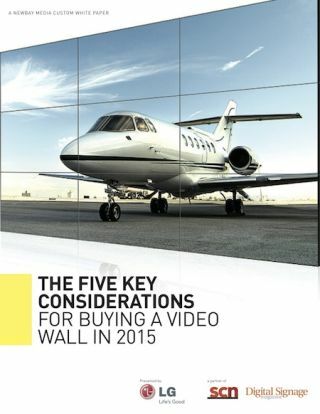 • See the White Paper here “The 5 Key Considerations for Buying a Video Wall in 2015” for more detail. And check out the stats for LG’s latest evolutionary 1.8mm bezel Video Walls from LG. And here’s a report on the specs and info on LG’s 3.5mm bezel Super Narrow Bezel Video Walls. Fast forward from the past eras of clunky video walls to today– and we’ve all seen the rapid growth in the installation of large, dazzling video walls in spaces public and private– from airports to corporate offices to sports arenas to universities. And even retail stores are taking advantage of the benefit of Video Walls to place branding and marketing where people shop. But with the proliferation of Video Walls, it’s important to learn which Video Wall technology is engineered to out-perform the lesser brands and models, so you can choose a Video Wall that is designed to not just dazzle but to impart your important messaging effectively, and is built to succeed in every environment. • The best video wall solutions that gives you the option to: A) use sophisticated third-party video processing platforms to feed content to your Video Wall and provide for advanced features such as interactivity (touch screen, gesture control, facial recognition, etc.) if needed, or B) use a display’s built-in SoC (System on a Chip) to eliminate the need for a third-party “media player” and so simply the system design and save on hardware costs. • The best panel displays feature the high-end panel technology called IPS (in-plane switching). The best IPS technology allows for an image with 8 million pixels, to ensure optimal color saturation and contrast for off-angle viewing (both horizontal and vertical). IPS technology also provides a screen surface temperature tolerance of up to 230 degrees Fahrenheit (110 degrees Celsius), which helps alleviate a common problem with screens overheating and, as a result, suffering from permanent picture quality damage (read more about IPS technology here). For more information on LG’s video wall solutions, click here.